Sure, we love horror movies, Funko Pop! figures and cereal. But combining the three? Yeah, that's a dream. The brand's new line of cereal not only comes in adorable packaging (and yummy flavors, we're sure), but each comes with mini-Pop figures, too. As Mashable reports, Funko Founder Michael Becker says the new line is set to launch in collectible outlet stores like FYE this June. “It’s just one more of those feel-good Funko items. I used to watch cartoons on Saturday mornings while I was eating cereal,” Becker told the Coronado Eagle & Journal. 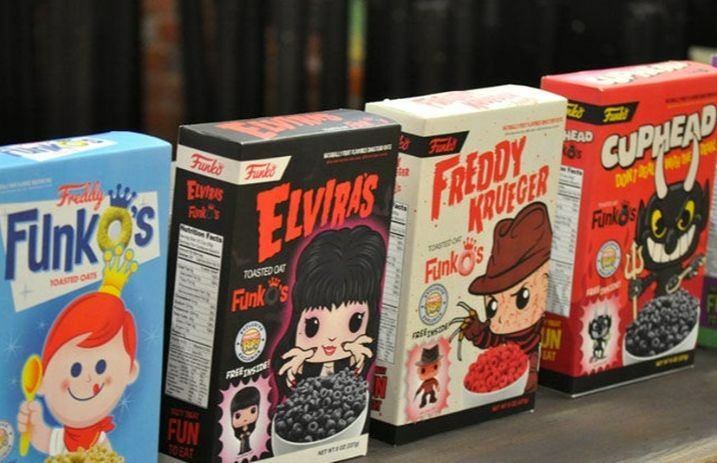 As Mashable explains, the characters included in their first line of cereals include: He-Man, Wonder Woman, Elvira Mistress of the Dark, Beetlejuice, Freddy Krueger and Funko's own Freddy Funko. Cereal and a Funko for $7.99 a box? We'll be picking up one (or a few), that's for sure.